My chicken is acting sick! What can I do to get her better? This is especially difficult for a Chicken Consultant to answer, because there are many illnesses a chicken can get, just like there are many illnesses humans can get. If you have a cough, is it bronchitis? The flu? Pneumonia? Whopping cough? Allergies? You may have to go to the doctor to figure out what you’re dealing with. Likewise, your chicken may have to visit the vet to get a firm diagnosis.Just like us, chickens can show many different signs of illness, and those signs can indicate multiple possibilities. If your chicken is ill, she may have picked up a bacterial infection, a virus, or a parasite. And I’m just not going to know which—not over the phone, not in person with you, and maybe not even if I could see and handle your bird. Remember, I’m a chicken consultant not a trained veterinarian! Another thing to consider is that since chickens are prey animals—many predators likes a chicken dinner—your pet’s instinct is to hide signs of illness if s/he can, so s/he won’t be picked out by a predator. I’m feeling fine–leave me alone! So, be thorough checking your chickens for signs of illness. Do it regularly, even if they seem to be acting healthy! Check under their feathers, be aware of cuts, or scrapes. Keep an eye out for creepy crawly bugs under their feathers. Check for bruising or discoloration of skin. Be aware of comb color, as a pale comb is an indication of illness though sometimes my birds combs go pale after a molt because they’re just not going to be laying for awhile. And if a chicken passes away from an illness the only way to know for sure is a necropsy done as soon as possible. This will answer your concerns about not only why your bird passed, but whether your remaining flock could be threatened by the same problem. What breed is this white/black/brown/etc. chicken I got in my order/yard/road/etc.? 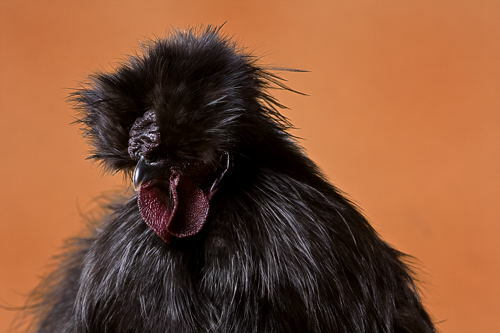 In North America alone, there are hundreds of breeds or chickens. Within those breeds, they come in different sizes (large fowl, bantam) as well as different colors. Sometimes chick color barely even helps narrow the field of possibilities. Some completely different breeds of the same color are extremely hard to distinguish from one another. IDing chicks is often all in the details. You can send us a photo and we Chicken Consultants can try to help as well. Just be aware there are lots of barnyard mixes out there, essentially crosses of several breeds. I also suggest searching My Pet Chicken’s chicken breed page. It has lots of wonderful images and explanations of the breeds. Even if you end up with a mixed breed, it may be a run of the mill mutt to chicken breeders, but we hope you found yourself a new friend for life whatever she/he is! Why didn’t my hatching eggs all hatch? This is a toughy. Whether you gave a broody hen the responsibility of hatching her own young, or collected eggs and placed them in your own incubator, hatching is a difficult task. What went wrong, and what went right can be difficult to determine.Remember, fertile eggs won’t develop into chicks just because they’re fertile. Chickens can leave nests early. There could be bacterial contamination at play. Temps and humidity can be off in an incubator, whether it’s homemade, high end, new, old, or somewhere in between. As a Chicken Consultant, I don’t really have any good way of knowing what happened in your incubator or under your broody.I can say that when I’m hatching at home, I play it safe and buy a thermometer to add to my incubator, because I’ve learned that my digital reading says 103 degrees but in reality its 99 degrees. Going by the digital reading originally, I didn’t have very good hatches as you can imagine! Here’s what you can do to increase your hatch rate. First, if you’ve had a bad hatch, check out our incubation troubleshooting guide to see if you can help narrow down the cause.I also always suggest running an incubator for a few days with your thermometer in place and just watch. Make sure the humidity doesn’t drop and the temps stay stable with no drops or spikes. Keep the incubator away from drafty windows, out of the sun, don’t unplug it or move it. Hatching can be touchy, and even developing chicks can stop developing and pass inside the egg. Most importantly, I suggest reading the My Pet Chicken Incubation guide through before starting, and refer to it if you have any issues during the incubation. As you can see sometimes a chicken question just doesn’t have a straightforward answer. The answer won’t be the same for everyone who calls the Chicken Consultant. However, there is a way for you to get the answers you are looking for, if you’re looking in the right place. Do you have a tough question you just couldn’t find the answer to? Great article, we often get asked lots of tricky questions. How to introduce new hens to an existing flock of chickens is the most common question. We started a care and advice page so people could go to that for our advice. I just moved to SW Georgia and want to start raising chickens (layers) in the spring. Can you recommend some good chicken coops? I want to have at least six hens. There are so many options online, and i don’t know what to look for. Thank you. Hi, Lynne! We talk about chicken coop requirements here in chapter 5 of our free Chicken Care Ebook. You can see there what’s *required,* and the other stuff will just be personal preference. While there are no real wrong choices once you’ve met the requirements, you can make things harder for yourself than necessary if you choose a coop style that is not conducive to the way you would prefer to manage your flock (fully confined? confined range? Part time range? We have a really good section in the published book we wrote that explains how to decide what coop to get based on how you plan to care for your chickens. That is different than the ebook and goes into more detail. But on a basic level when looking at coops online, the mail thing you’ll want to do is make sure your coop provides enough space for the number of birds you plan to keep. Again, the other stuff is personal preference and will just affect how hard or easy you make it on yourself when it comes time for cleaning, filling feeders, gathering eggs and so on.